Building Collector: A Silver Sears Tower? The Chicago Sun-Times newspaper is reporting that the New York-based owners of Sears Tower in downtown Chicago are considering painting the entire building silver. The well-known black skyscraper has been part of the Chicago skyline since 1973 and is now the tallest building in the United States. Thoughts are that the expensive paint job could draw fresh attention to the tower, which has struggled to hold tenants as newer generations of office buildings are built. Silver could figure into a broader effort to "rebrand" the building and highlight its advances in energy efficiency. A spokesperson for the owners said, "We are actively looking for even more ways to save energy and improve the building," he said. "We are still examining our options and any details at this point would be speculative." Switching to a lighter tint to complement the silver could cost $50 million, "and right now there's not enough money in the universe for that," said a source familiar with the tower. 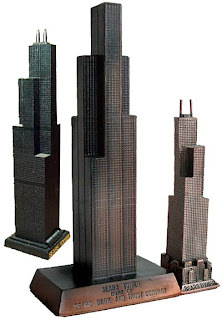 Unlike the real structure, Sears Tower Souvenir buildings already come in different colors. A gold-finished Sears Tower pencil sharpener from the 1970’s was made in Japan. Banthrico produced a 7.5 inch copper colored bank building also in the early 70’s. Other versions include a 5-inch pewter replica, a 7.25 inch plastic tower and a sterling silver charm. In 1969, Sears, Roebuck & Co. was the largest retailer in the world, with about 350,000 employees. Sears executives decided to consolidate employees into one new building to be constructed on the western edge of Chicago's Loop. Designed by chief architect Bruce Graham and structural engineer Fazlur Khan of Skidmore, Owings and Merrill, the real building opened in 1973.The fortunes of Sears & Roebuck declined in the 1970s as the company lost market share and its management grew ever more cautious.The Sears Tower itself was not the draw Sears hoped it would be, so the tower stood half-vacant for a decade as more office space was erected Chicago in the 1980s. The company was eventually forced to take out a mortgage on its signature building. Sears began moving its offices out of the Sears Tower in 1992 and had completely vacated the building by 1995. 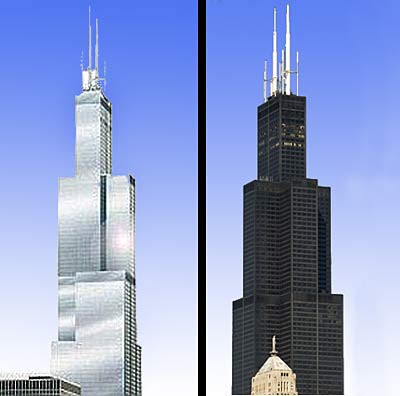 The Sears Tower has gone through several owners in the years since, but Sears has retained the naming rights for the building. It is now a multi-tenant office building with more than 100 different companies in residence, including major law firms, insurance companies and financial services firms.The building was the scene of some excitement when, in August 1999, French urban climber Alain "Spiderman" Robert, using only his bare hands and feet, scaled the building's exterior glass and steel wall to the top. A thick fog settled in near the end of his climb, making the last 20 floors of the building's glass and steel slippery. A Skydeck observation platform at the top of the Sears Tower allows visitors to get a similar, but safer spiders-eye view of the windy city. On a clear day, you can see four states - Illinois, Indiana, Wisconsin and Michigan. What do you think about the idea of painting this iconic structure? Leave your thoughts via the ‘comments’ link below.